M&S Parking: After Bloomberg leaves office, will NYC's bike lanes remain? After Bloomberg leaves office, will NYC's bike lanes remain? There is growing concern among New York City's cyclists that the city's bike programs are in jeopardy once Mayor Bloomberg leaves office at the end of this year. According to The New York Times, mayoral candidates are showing little support for the current bike-friendly policies, and may, if elected, eliminate some bike lanes. While poll numbers show that 66 percent of New Yorkers favor the bike lanes, finding any candidates willing to expand or maintain the current program is proving difficult. City Comptroller John C. Liu, a possible mayoral candidate, said that eliminating some of the existing bike lanes would be "a likely scenario in some parts of the city, particularly Brooklyn and Queens," if he was elected. Other candidates have been criticized for suggesting the bike lanes should be studied for their effectiveness, and eliminated or changed where needed. 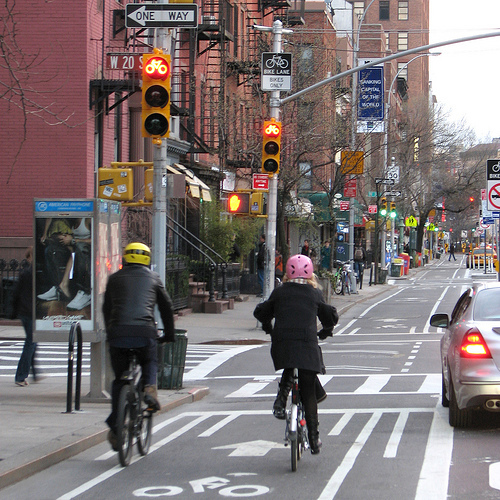 What do you think about NYC's bike lanes? Are they effective in helping cyclists and motorists share the roads?